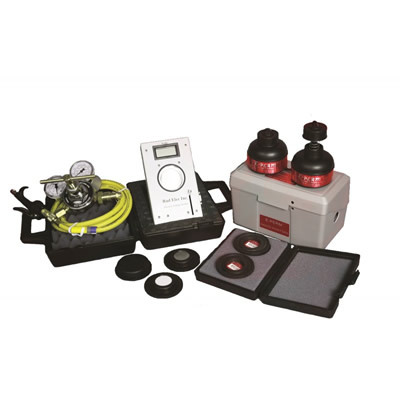 Radiansa supplies a range of detectors and monitors for the measurement of radon gas levels in air, water, and soil. 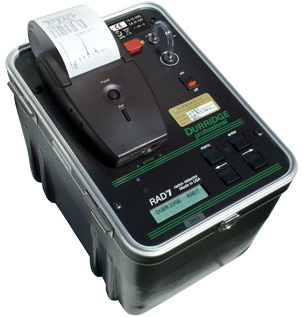 The Durridge RAD7 is a fast-response radon monitor, widely used in industrial and academic studies of radon concentrations in air, with optional accesories to enable the device to measure radon concentraciones in soil and water, also to measure radon flux from surfaces. he virtual absence of intrinsic background (0.2 Bq/m3) gives the RAD7 an extremely low detection threshold, easily measuring below 4 Bq/m3. Data can be displayed on the unit's LCD, printed on external printer (supplied) or downloaded to a PC for further analysis. The unit is a complete, portable stand-alone system with a built-in air pump, supplied in a rugged carrying case, total weight 5 kg. Sampling for soil gas concentration measurements is made at depths of up to one metre to avoid contact of the sample with surface air. The Soil Gas Probe perforates the surface, and connects to the RAD7 using the hose provided, to enable soil gas concentration measurements. 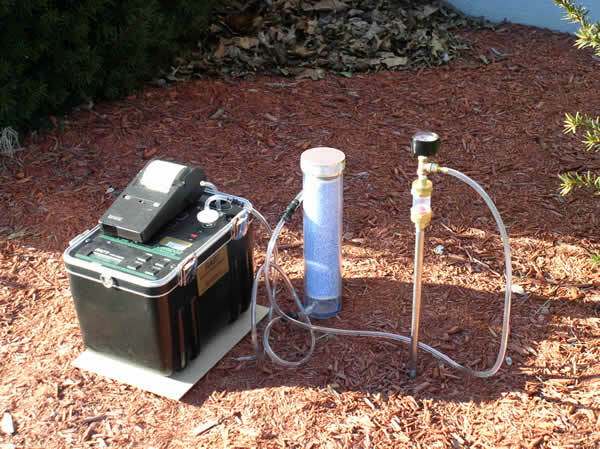 The RAD H2O accessory is used to measure radon conecntration from samples of water (40 ml or 250 ml bottles, provided). 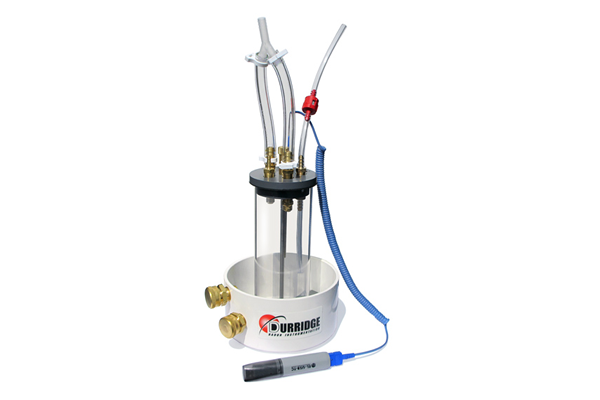 The equipment is portable and battery operated, and gives results after 30 minutes analysis with a sensitivity that matches or exceeds that of liquid scintillation methods. The method is simple and straightforward, with no harmful chemicals to use. The RAD AQUA enables the continuous monitoring of radon in water such as groundwater, lakes, rivers, and other aquifers. The device consists of a spray chamber, called an "exchanger", that brings the radon concentration in a closed air loop into equilibrium with the radon concentration in a flow-through water supply. The radon in the air is monitored continuously by the RAD7. 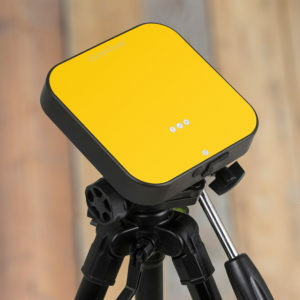 The Corentium Pro, from Airthings, is a lightweight continous radon monitor, that tranmits data to mobile devices via bluetooth for visulaization, and can connect to a PC via a USB port for download and analisis of results. The device runs on 3 x AA batteries, average lifetime 1.5 years, and incorporates temperature, atmospheric pressure, and relative humidity sensors. The internal memory can store up to 5 years of data (at 1 measurement per hour). The standard deviation from the exact radon level is less than 7% + 5 Bq/m3 after 24 hours. 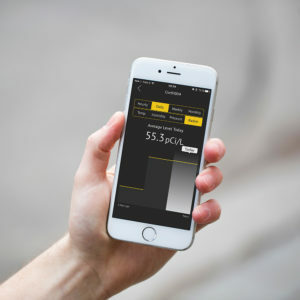 The mobile app and PC software, to visualize, download, and analyse data on a mobile device running iOs or Android is supplied on a USB memory stick. The app can also downloaded. 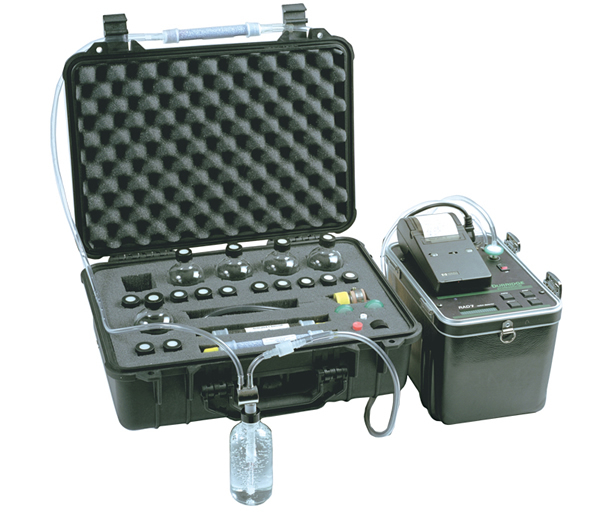 The Radon Scout Plus is an easy-to-use instrument for measuring radon concentration in air, updating the measurement every 1 hour (a 3 hour integration period can also be specified). Data is shown on an LCD screen, and is downloaded to a PC for storage, visualization, and analisis. The instruments can measure a radon concentration of 100 Bq/m3 in 3 hours with an uncertainty of 17%. The internal memory of the instrument can store 2047 data sets (85 days of measurements at 1 measurement per hour), including radon level in Bq/m3, exposure time, temperature, relative humidity, atmospheric pressure, and measurement precision. The device connects to a PC via USB or RS-232 connections. The instrument runs on 2 D-size batteries, and has a connection for an external power supply. The E-PERM system is based on the deployment of passive detectors (electret ion chambers) with no moving parts or electronic components in several measurement sites simulataneously. As passive devices requiring no power supply, electret ion chambers are suitable for use in a wide range of locations and conditions. Each detector comprises of a chamber (short term or long term version) and an electret (short term or long term version); the voltage on the electret es read before and after the measurement period using and electret reader. 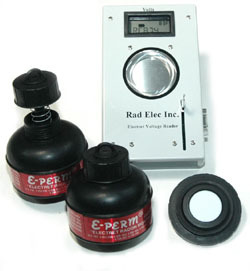 Radon concentrations are then calculated from the electret voltage reduction using the supplied software or speadsheet calculator. Short term measurements (several days to several weeks), and long term measurements (several weeks to several months) can be made, depending on the combination of chamber and electret used. Accessories for the measurement of radon in water, and radon flux from soil, are also available.